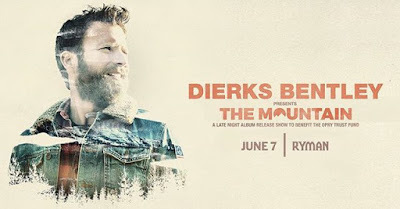 Dierks Bentley To Perform Album Release Show at the Ryman During CMA Fest! Dierks Bentley announced today that he will perform his new CD "The Mountain" from top to bottom at the Ryman Auditorium on Thursday, June 7, 2018 at 10 PM during CMA Fest! LANCO is set to open the show and tickets go on sale this Friday, May 18, 2018 at 10 CT! Tickets include a copy of "The Mountain" on CD!